Yesterday was a beautiful winters day sun in and out some clouds and not too cold. Today we are having sleet and snow won’t amount too much just enough to cause poor driving conditions. Had quite a nice lunch out with friends yesterday and watched a few people skiing on Berkshire East. We have been so lucky with winter weather this year. The inside hens are laying and I was really surprised in the difference of color of the eggs. 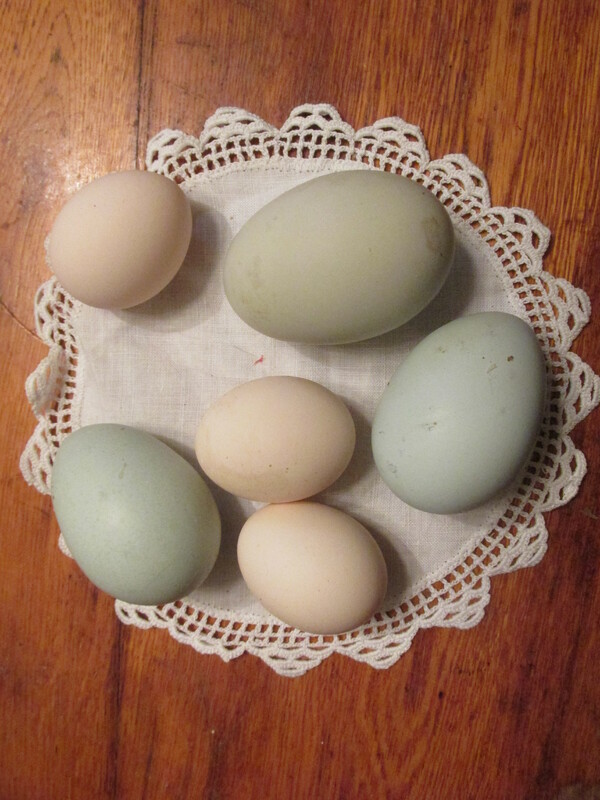 I really though of Helen’s and Gladys eggs were the same color but as you can see in the picture one is olive-green and the other is blue. Love the colors. I have a new spinning student coming to the house. I had forgotten how exciting the process is to a new student. It reminded me of my early spinning days . How excited I was to find a different fleece, be it the color or breed.To make my own yarn from it, learning how to spin a fleece and to dye wool. All these things have held my interest for well over 30 years. 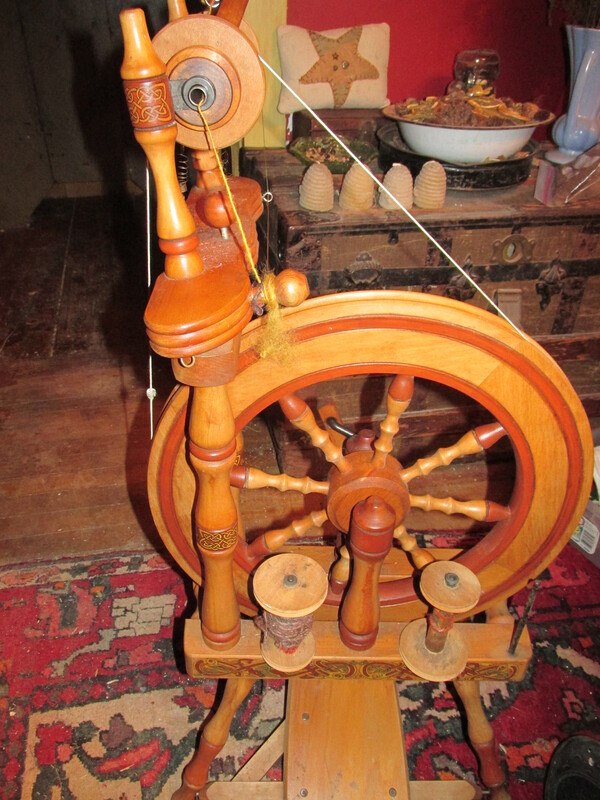 I love teaching spinning and passing on this historic craft and the knowledge of sheep on. My new student plans to get some sheep, she has thoughtfully checked out breeds and fiber and will give a couple of lucky sheep a good home. 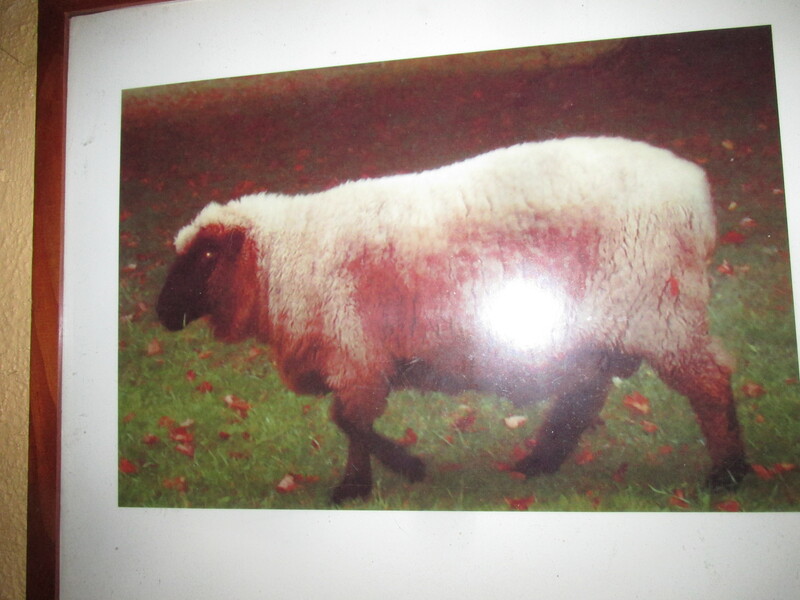 Wilbur has been gone over 5 years now but his presence remains through his yarn, fleece and roving. Two of his great grand daughters are here on the farm. Not everyone liked Wilbur he was a big, very shy sheep, I was very fond of him and was glad to give him a forever home. I share his remaining wool with friends these days. My friend Sandy wanted more Wilbur wool to give to her sister, Marti who has fallen in love with Wilbur. This was before the holidays and I forgot all about it. I happened to see Sandy this week and Marti sent up a gift. How appropriate. 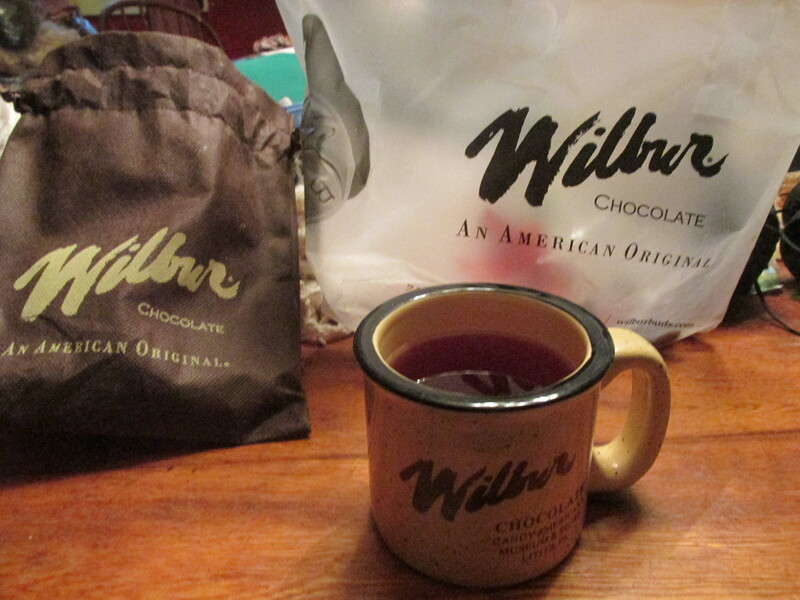 Now I have a Wilbur mug, a sweet little bag which fits my knitting nicely and some wonderful chocolates. I still have more Wilbur to share. Thanks Sandy and Marti. This project has been waiting in the wings for a purpose for many years. 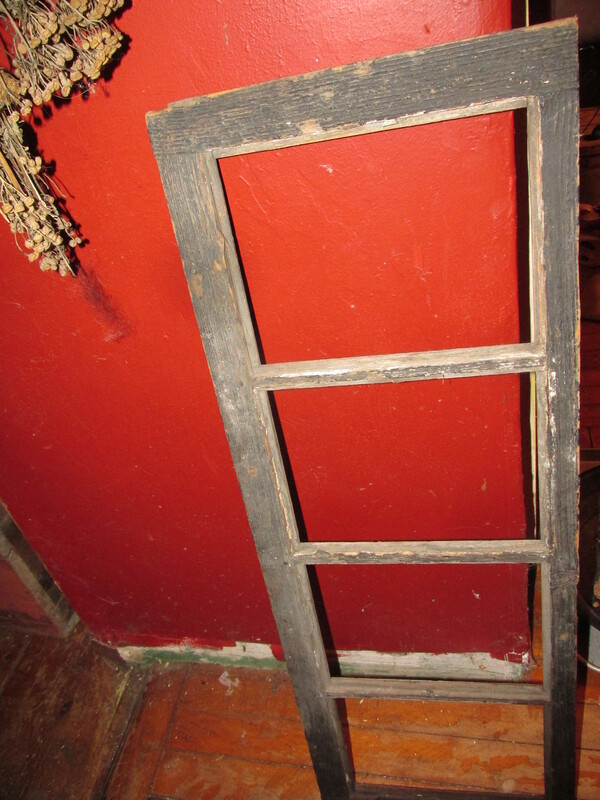 I asked a friend to be on the look out for some small windows for the Chicken Coop. She came back with three, two of which are in the coops now. I loved this one and knew it had a purpose but for what!!!!!!! 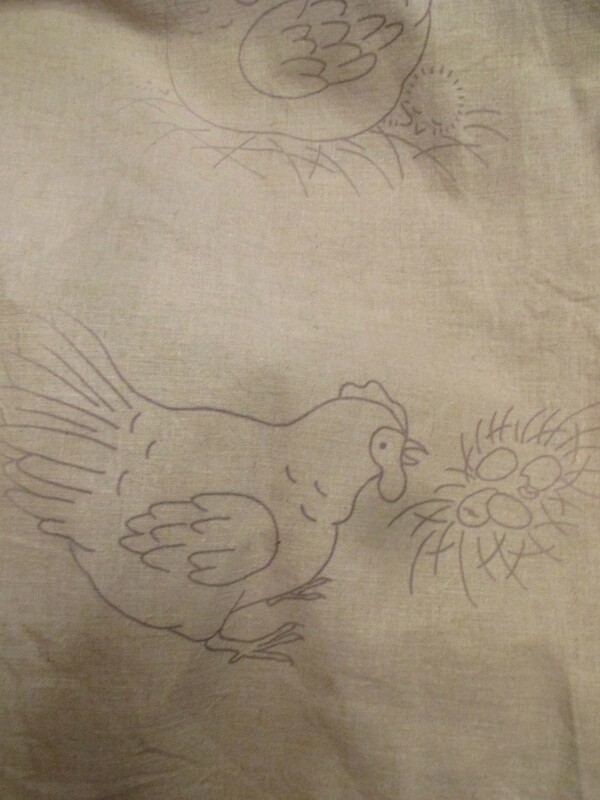 I have gotten back to embroidery again and saw some transfers of chickens and ordered them. The four windows will contain different embroidered chicken pictures. It will make an unique frame and interesting pictures to hang on the wall. I am on the look out for more windows which I think might sell. We are lucky to be having beautiful fall weather while other parts of the country are in crisis mode with severe flooding. The wash is on the line and I am ready to get going a full day of chores. 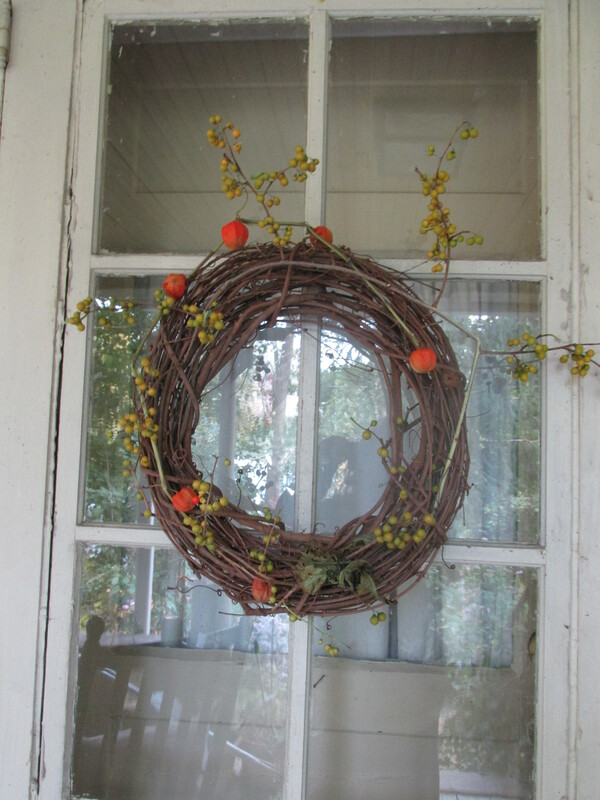 I put this wreath together yesterday with Chinese Lanterns and bittersweet from the yard. The bittersweet is not quite open yet but in a few days it will be in full bloom. 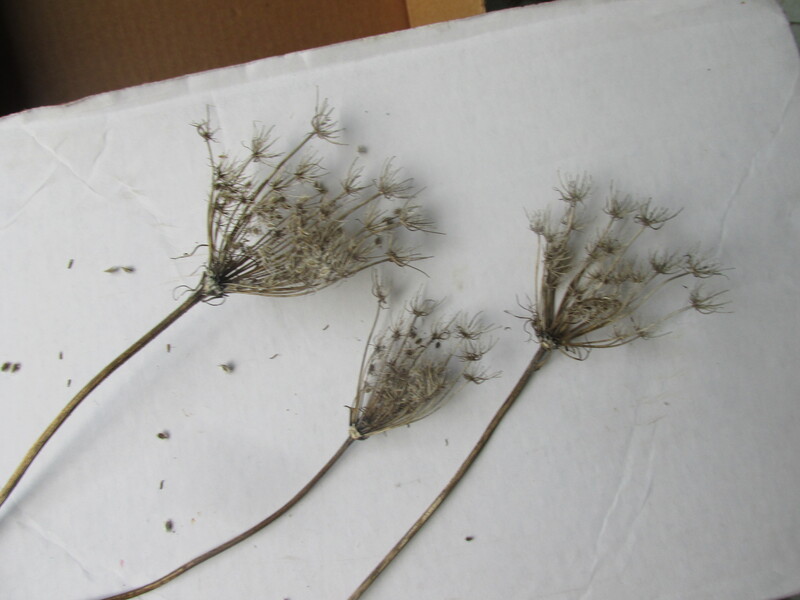 This morning it was in the low 40’s so I had better get my herbs picked and dried. Frost will be here before we know it. I got the window up in the Chicken Coop. The wire in front needed fixing so that was done too. While I was doing that I noticed a few boards that needed to be nailed in and did that. It’s never just one thing!!!! 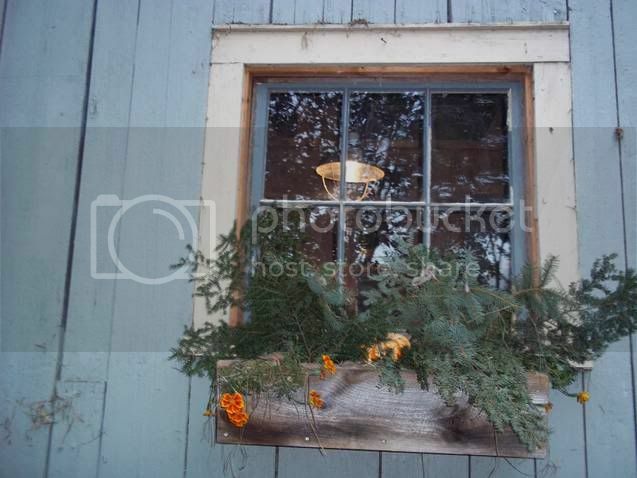 I also decided to get the evergreens picked and put in the window box before a hard frost. I added a pumpkin and some bittersweet for a fall decoration. 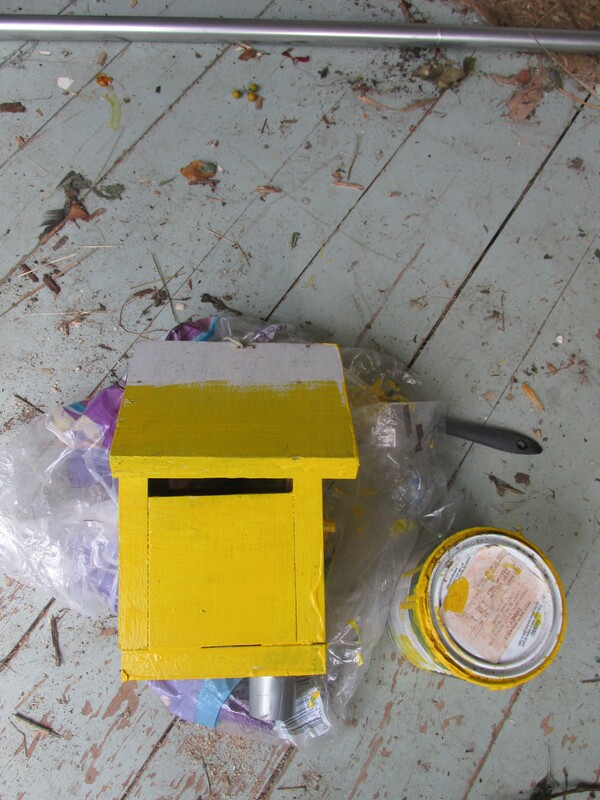 So many of my bird houses this year need repair. I am painting one of them and hope to get it up sometime tomorrow. There are three more to fix and get up. 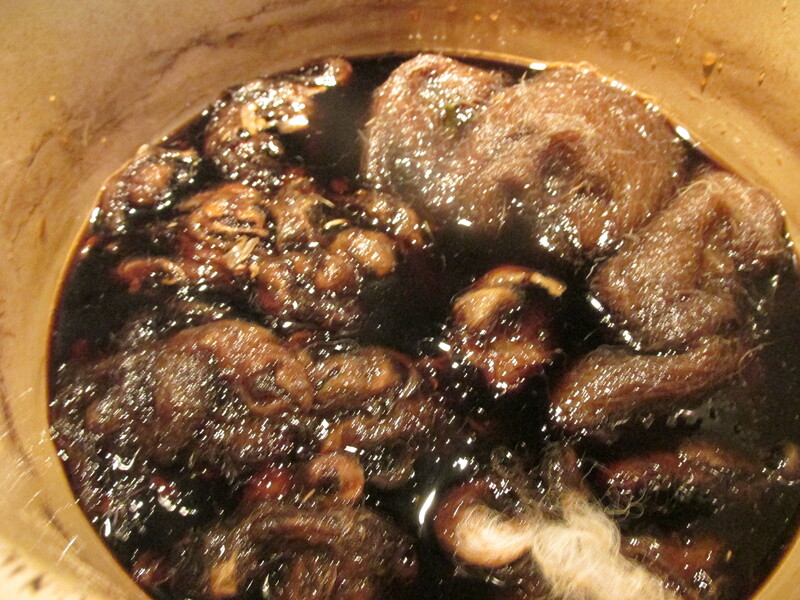 I got my old walnut hulls saved from last year and am now doing some dyeing . I have left the wool in with the hulls overnight. I am hoping that it gives the wool a darker color. I have been looking all over for a Chervil to embroider. They are none that pleased me. The other day I was going to the bank in Shelburne Falls and parked in the parking lot and saw some Queen Ann Lace. It looks great in its fall state so I picked three and now am working on a pattern. 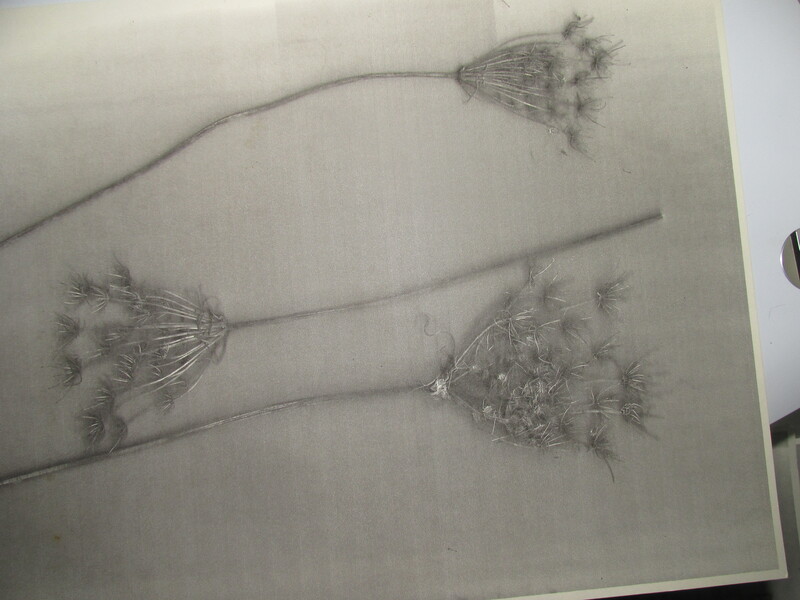 I cut them in half and put them on my copier. I hope the copy is clear enough to copy free-hand on my fabric. I plan to start it tomorrow and will let you know how it comes out. Morticia is sitting on two eggs this morning and acting very broody. As soon as the two roosters start crowing she and Samantha will be moved outside, sharing the side yard with Mrs. Brown,Hazel and Millie. They will be separated for a time until they get used to each other. 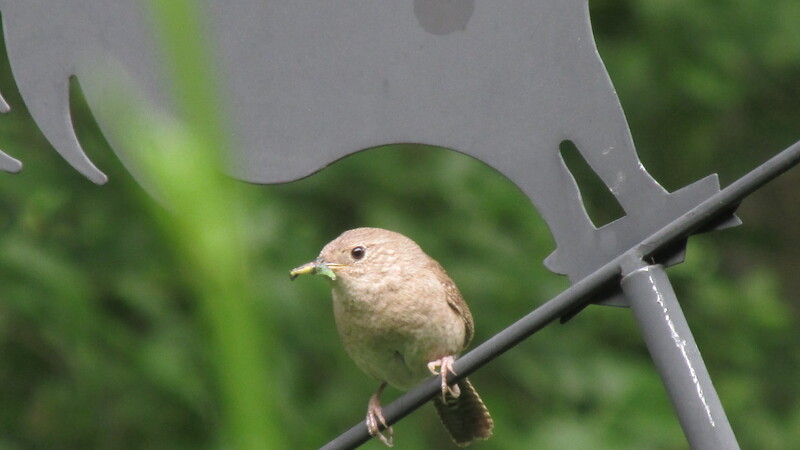 Mom and Dad have been feeding the young in the front bird house.
. They are small birds with sweet voices. I think they are Wrens. 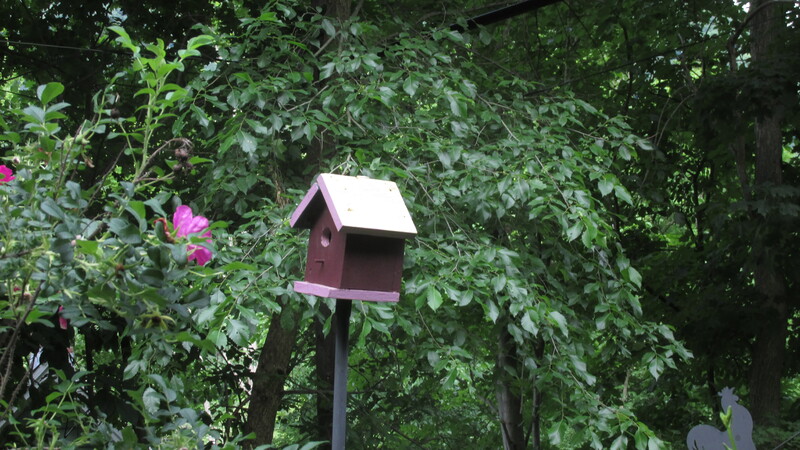 The side bird house has chickadee’sin it this year. There is a large Robin’s nest in the willow tree and a Blue Jay nest in the CHestnut tree next door. The morning songs are wonderful. The Greenfield Farmers Coop lost a valuable employee this past week. Jimmy passed away suddenly. He was my to go to person for anything to do with animals. He was helpful, funny and kind. He will be sorely missed. It reminds me to take the time to tell people how much I appreciate them. Yesterday I got a surprise in the mail from my friend Susan. T wonderful red embroidery pieces. 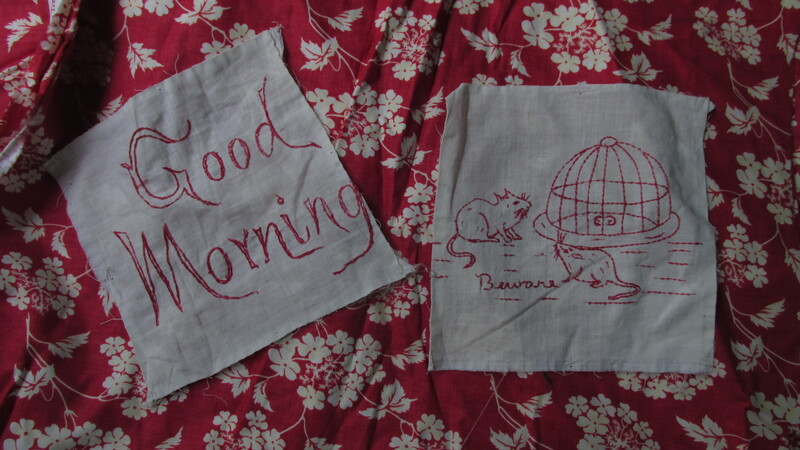 I just love them and will incorporate them into a small bed pillows. 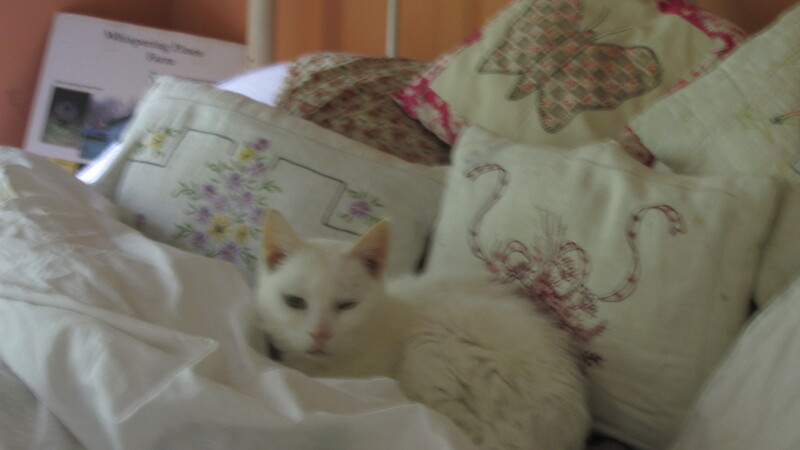 I have bed pillows and use them every night and Minnie does too. They made my day. I want to do more embroidery this year and last year bought a book on patterns. I have started one but used a flimsy muslin and now realize that I really needed a stronger more dense fabric. The boys and I cleaned out the most of the bottom of the barn yesterday. It is all orderly and things easy to get to. They both are so very helpful to me. Today we will spend some time in the attic. I want to clean it out and label each box. It will be time consuming to do that but in the end I will save lots of time knowing what is in each box. I am sure I will find some treasures too. 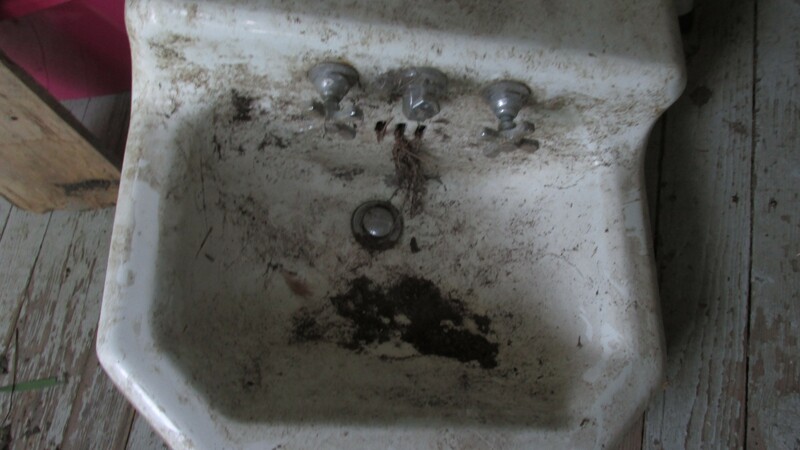 This sink was at the side of the road. I loved it and had many ideas of what could be done with it. 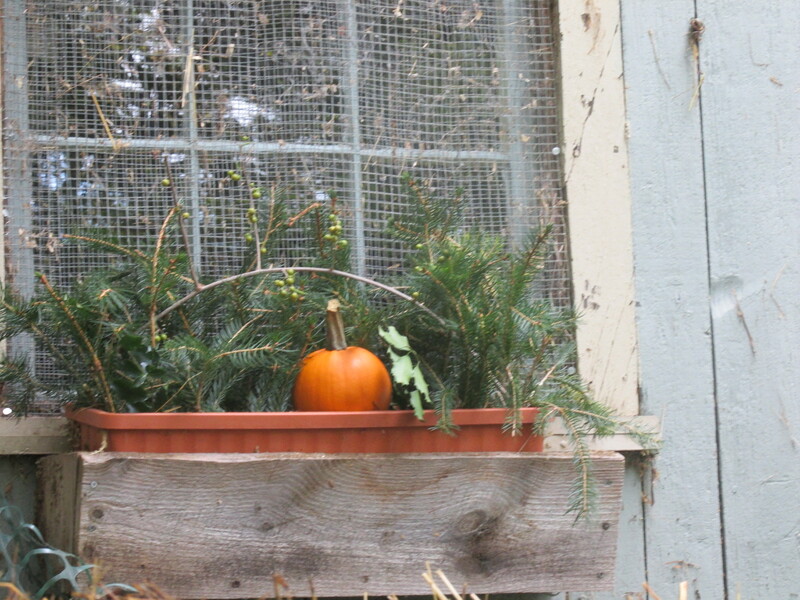 But it was fall then so it was put in the back of the downstairs barn. Rediscovered again yesterday, Ricky will make a bird bath for the side yard out of it.